Albuquerque, New Mexico. December 10, 2013— Andy “Wake Self” Martinez is proud to announce the next video from his most recent album, The Healing Process. 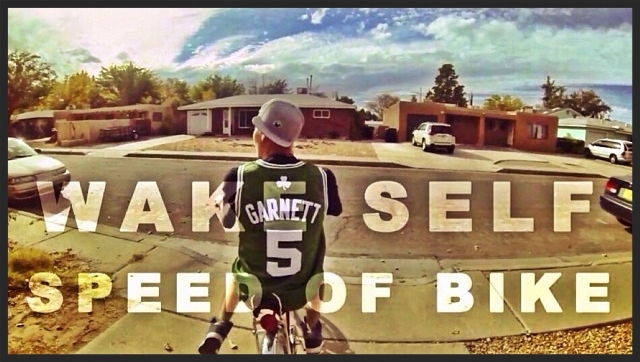 Titled “At the Speed of Bike,” the song takes the listener on a journey through a day in the life of Wake Self while flawlessly executing a solid track built on DJ Young Native’s cuts and PH8’s production. The song proves, once again, Wake is determined to set himself apart from the monotony of mainstream, contemporary hip-hop. Insightful and original, Wake speaks truth, first and foremost. While this song is bit more playful than previous efforts, at the core is Wake’s message of positivity. The video, produced by Concept Flux Media, balances Wake’s youthful nature with the seriousness of what he’s trying to get across. The Healing Process dropped on April 25 and is packed with endless introspective, intelligent lyrics and Wake’s impeccably smooth delivery. Check out “At the Speed of Bike” here.